Back in the good old days when morality and law of nature reigned supreme, our forefathers had a way of ensuring that justice was done in the case of one wrongly accused and humiliated erroneously. When such a person is finally vindicated and proven to be innocent of the allegations against them, he/she is not just made to go home and forget the humiliations that have being unfairly meted on him/her; they are usually compensated with plot(s) of land or with cattles. This single act of morality ensures that justice is done to any one that may have suffered any form of injustices. This act proves that our ancestors recognises the fact that "an injustice to any one anywhere is a threat to justice everything". Read also:BIAFRA: IPOB NOT UNLAWFUL: WILL NIGERIAN ARMY AND POLICE OBEY COURT RULING? That was how our forebears ensured that no one was deprived of justice and that no one was denied compensation in cases of miscarriage of justice. 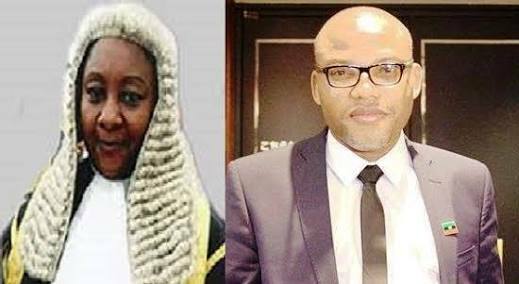 In the case involving the leader of the Indigenous People of Biafra, Mazi Nnamdi Kanu & 3 Others against the Federal of Nigeria, its important that the Judge handling case, Justice Binta Nyako does the noble thing that any honest Judge would have done by admitting the accused to bail since she has been able to establish that most of the charges against the accused lacks merit as there were absolutely no evidence to support such charges. She showed courage during the last adjourned date of the trial by striking out 6 out of the 11 charges against the accused. However, a critical look at the remaining charges shows that all but one equally lacks merit for it to go through trial as the Prosecution failed woefully to state the actual dates that the alleged crimes took place or were committed. Of course, stating the date a crime took place is a fundamental requirement in law especially as stated in the Administration of Criminal Justice System. Justice Binta Nyako's ruling that IPOB is not an "unlawful" group gives her an opportunity to engrave her names in gold especially amongst the Benchers. She has a golden opportunity to vindicate herself by making sure that just like in the times of our forefathers that the innocent freedom fighters are granted immediate bail pending the determination of the suit against them. She must make sure and ensured that the fact that IPOB has remained peaceful in spite of the killings of her members by the Nigerian Army is not used by the murderous Nigerian government to deny them the right to self determination as enshrined in the United Nations charter on the right of the Indigenous People. She must take time during the court sittings to educate the prosecution that the right to self determination as demanded by IPOB from Nigeria is legal and does not constitute a crime under any law. March 20th and 21st, 2017 promises to be a day that history beckons for Justice Binta Nyako to right every wrong that has happened under her watch since this case was assigned to her after the shameful charade of John Tsoho. She must know that the world is watching every move she makes and every decision she takes. She must make ensure that the shameful dance of judiciary gymnastic and summersaults that took place under, Judge John Tosho is not repeated. Alert!!! Buhari And Northern Elders Orders Nnamdi Kanu And Others To Be Assassinated Before Tomorrow Morning!! !